Our science community is suffering from the same fatal ailment as the rest of our society, corruption, and fraud. Scientism the faithful belief in scientists to be truthful and honest, is a false paradigm. A lot of so called scientific, technological and medical research findings, that are published in our modern media and peer review publications, are outright fraudulent. These research findings are nothing more than corporate propaganda, to influence our purchasing habits, so they can make big profits. 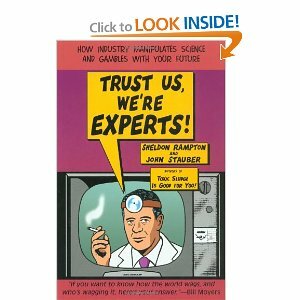 Trust Us, We're Experts” Here is a great book on how scientist and medical professional skew the truth. To summarise, they get very well paid to lie. It is worth just reading the synopsis on Amazon page about the book if nothing else. Here is a small excerpt. A lot of medical studies and research findings are released each year. After investigation by independent researchers, it is often found that up to 90% of these studies have no real substance to them, and are no more than just propaganda to promote the pharmaceutical industry profit agenda. Silent Forests is a documentary narrated by David Susuki, about the bad use of genetic science to promote a particular companies financial agenda, for GMO products. In this case forest trees that produce a toxic insecticide BT. This science has the potential to create an environmental nightmare. Large profits can be made from it in the short term, but at what cost to us and future generations? Organic farmers are having their lively hoods destroyed because pollen from genetically modified crops drifts into their fields. GMO companies are now shifting any future liability from damage that may arise from the use of their GMO products, to the farmer's who have purchased and used their GMO seeds. These examples show that the world is facing a crisis situation. All our social systems, financial, scientific and technological, have been taken over by greed and corruption. Profit comes first and the human community and the Earth's biosphere last. A person who is willing to support a lie in the corporate or government interest, gets promoted, plus gets paid lots of money for promoting the lie. Even if the result of that lie could result in the deaths of large numbers of people, and irreparable harm to the environment. If the wider community does not take action to stop this, it will get worse. Corrupt people or organizations will constantly test to see what they can get away with. If there is no resistance they will become more emboldened. Whistle blowers should have communities standing behind them and supporting them. They should be rewarded by our communities, for standing up to this, out of control, wide spread corporate and government corruption. This is an American site about whistle blowers but you get the idea. 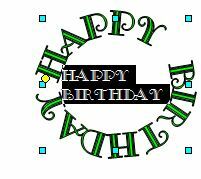 It is worth having a look at the blog on this page also. Our society needs to be re-ogranised so that those who have the community interests at heart get promoted. At present our social systems promote those who are psychopathic. This is an excellent documentary on this very subject. "I Am Fishead" Are Corporate Leaders Egotistical Psychopaths? This community radiation monitoring station was created in response to detections of multiple radioactive clouds passing through. Click these links to find detailed documented information on these significant detections in Australia, and New Zealand. This short animation of Northern, and Southern Hemisphere air circulation, shows why we can get detections so far south. For the Sunshine Coast Queensland Australia, the recorded 4 year average local background radiation level was ~ 0.10 uSv/hr before the Fukushina Nuclear Catastrophe, see historical chart at bottom of page. Once the GammaScout Alert Geiger counter recorded 24 hr 60 second logged data of the day has been downloaded, it is analysed and then posted here the next morning. (Note: The reference monitoring station's GammaScout Geiger counter died on the 12th September 2018, RIP. The last full day average it recorded was on the 11th September 2018. The GammaScout was used as a reference for many years up until it stopped working. At times significant peaks in radiation maybe detected which would warrant the issuing of a cautionary email advisory or an alert. To be placed on the radiation advisory alert list simply click on alertregister@sccc.org.au, address, and send. Please take the time to read any email advisory or alert, and come back to this web site during the day for further updates. An Oncologist in Japan Dr. Atsuo Yanagisawa, has been doing ongoing research on the Fukushima Nuclear Disaster site workers, and has found he is getting very good results with Liposomal Vitamin C. It appears to be healing a lot of radiation damage to their bodies. Liposomal Vitamin C is a combination of vitamin C and lecithin. This combination seems to improve the up take of vitamin C by 80%! It maybe a good idea for you and your family to research taking this to fortify against the effects of these radiation clouds coming through. He has been trying to encourage the Japanese government to educate their people about this treatment. A study from the Perelman School of Medicine at the University of Pennsylvania found that flaxseed may help protect lungs against the damage caused by radiation exposure. The researchers believe that flaxseed might also have a role in protecting other healthy tissues and organs, before exposure to radiation. It can even significantly reduce damage even after exposure. 11th August 2015 - The Pacific Ocean Is Dying! International list of live radiation monitoring stations, to help people in case a major nuclear event were to occur. This interview provides deep insights into the seriousness of the Fukushima Nuclear disaster, and Tepco’s management mind set. Free DIY food testing lab guide Local Weather Radar & Local Rainfall for any day, month, year, or a defined period, can be looked up here. From the Northern Hemisphere atmospheric nuclear bomb testing studies the ratio of fallout between the Northern and Southern Hemisphere worked out to be about 5 to 1. The dynamics of the releases from the Fukushima Nuclear Catastrophe would be similar. This suggests a lot less contamination from Fukushima is reaching the Southern Hemisphere, compared to the Northern Hemisphere. 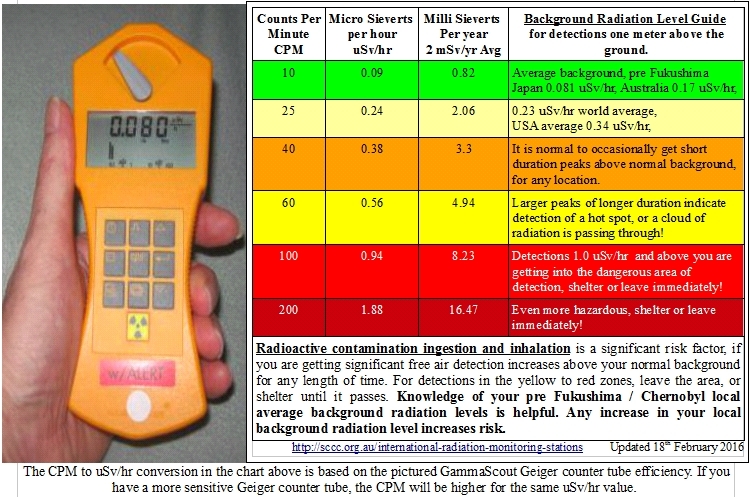 After 2011, radioactive cloud detections were recorded in Australia and New Zealand by people with Geiger counters. There were only a few people actively recording background radiation levels at the time. These Australia and New Zealand reports are based on their detections. Because of the limited monitoring, we have no idea how wide spread throughout the Southern Hemisphere these significant radioactive clouds events were. A number of these recorded radioactive cloud events were free air detections on hot fine days, so they can’t be put down to Radon-222 rain washout events! Small amounts Radon-222 gas is in the air we breath all the time. Depending on the regional geography, large radon washout events can occur in any country. Large Radon-222 washout events were detected in the Nimbin and Mullumbimby areas in late January 2013. Here is a theory put forward by the people running the Nimbin private monitoring Station at the time. Nimbin is located on the east cost of Northern New South Wales Australia. The area had been in a dry period, and the underground aquifers water levels were low. A flooding rain event came through, and quickly forced a large amount of radioactive Radon gas into the atmosphere, that had built up in the aquifers during the dry period. The Radon daughter isotopes were then washed out of the atmosphere during the rain event, and detected on the rain swabs. We haven't seen any studies on the heath effects of being exposed to very large Radon washouts, but would suggest staying out of the rain during these events. Read the October 2012 Radiation background monthly report here, for a couple theories why atmospheric Radon levels may have increased since Fukushima. A well as Radon-222 and occasionally Radon-220, trace amounts of Iodine I-129, Beryllium Be-7 and Lead Pb-210, have been detected in the rain water tests. Even though the amounts detected maybe below Government set risk levels, it is suggested that those who are using tank water should use good water filters, and those on town water use a good reverse osmosis water filter. Also wash your fruit and vegetables well before cooking and eating. Years of rain water, and rain swab test results can be found here. The recent data collected here indicates that the increase we saw in local background levels after Fukushima has stabilized. Compared to just after 3/11, the number of radioactive cloud events detected passing over the area has decreased significantly. In 2015 test results indicated some of the increase in November and December 2015 local background levels were from increased Southern Hemisphere volcanic activity. The 2016 year average was 25% above pre-Fukushima recorded year average. This was highest year average recorded here so far. At this Southern Hemisphere location, the local year average background has seen an increase in local background levels since Fukushima. If we are seeing a steady increase in year averages here in the Southern Hemisphere, it suggests that locations in the Northern Hemisphere are seeing much greater yearly increases. At Fukushima there are still three highly radioactive molten cores in china syndrome, with large volumes of underground water flowing over them. This large volume of contaminated water is continually flowing into the North Pacific Ocean. This, plus the large atmospheric radioactive releases are creating Planetary Thermal Imbalance & Extreme UV Levels, and also causing cross species animal die off’s in the Northern Pacific Ocean. The 4yr pre-Fukushima recorded local background was ~ 0.1 uSv/hr, hence the above 4yr reference in the charts. Here are detailed historical charts for 2018, 2017, 2016, 2015, 2014, 2013, and 2012, plus pre-Fukushima local background radiation levels. Daily average local background radiation level charts, and event reports for 2019 are below. Click your web browser refresh button to see latest chart update. Disclaimer: This is an amateur volunteer run service. Human error can provide incorrect information, and equipment malfunction can produce false readings. 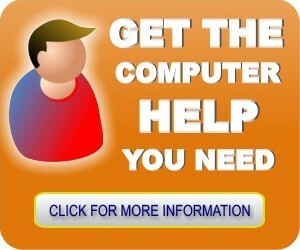 Do not rely on, or take action upon information presented on this web site, without further research. Views expressed in the pages or images on the SCCC Inc., site are the personal opinions of the relevant writers, and are not necessarily representative of those of SCCC Inc.
Is travelling in the Northern Hemisphere safe? There are increasing independent reports coming in from people with radiation testing equipment that is strongly suggesting that travelling to certain areas in the Northern Hemisphere could be a serious risk to you and your family's health. I know a lot of members travel, that is why I have written this article. 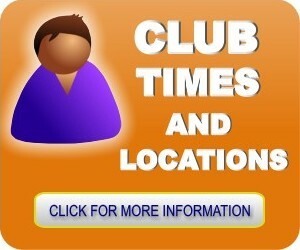 Study the information in the articles provided, and do further research before making travel arrangements. It could mean the difference between life and death for you or a family member. Radiation fallout will not kill you instantly, but depending on the internal and/or external doses, it can considerably shorten one's life. Last year the Japanese tourist industry was offering ten thousand free flights to Japan. They said that the Fukushima nuclear disaster was under control, and that is was now safe to travel there, as long as you stayed outside of the Fukushima Nuclear Disaster exclusion zone. The evidence provided here strongly suggests otherwise. This very recent February 25th 2012 independent report shows a recording of 6.5 uS/Hr background level of radiation at Tokyo Station. For those who don't understand what 6.5 uS/Hr means, it is 65 times higher than our average local background, and ten times Chernobyl mandatory evacuation level. At this level, it should also be a mandatory evacuation zone, the same as the Fukushima nuclear disaster zone! Tokyo railway station is a railway station in the Marunouchi business district of Chiyoda. Tokyo station is near the Imperial Palace grounds and the Ginza commercial district. It is the main intercity rail terminal in Tokyo, the busiest station in Japan in terms of number of trains per day, with over 3,000 trains per day, and the fifth-busiest in Eastern Japan in terms of passenger numbers. Tokyo railway station has tens of thousands of men, women and children travelling through it daily. It means that a lot of radioactive dust has been transported from contaminated areas by travellers and it is also being stirred up as they move through the station. Ingested radiation from contaminated food, liquids or air, radiates body cells with high doses of radiation for long periods of time. Radioactive dust breathed in is very dangerous because if it gets stuck in you lungs, it will irradiate the cell it is next to, and those around, it with high doses of radiation, and you can't walk away from it. Unlike a piece of radiation that maybe lying on the ground. So this is a very serious health issue for anyone travelling through, or working at the station. 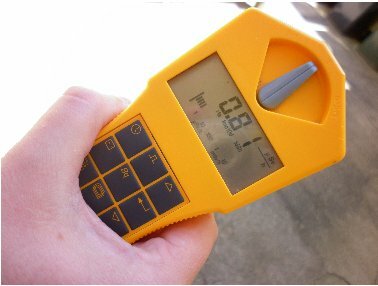 Is it now necessary to own a Geiger Counter and learn how to use it properly, if you intend travelling overseas? This is a question some of you may have to ask. I will be available to show you how to use a Geiger counter at club meetings, for those who are interested. This is the cheapest Geiger I have seen, but only if you already own an iphone. Are aircraft flights across the Northern Hemisphere also becoming very risky? All the evidence is suggesting that a lot of the fallout from Fukushima Nuclear disaster is still being released into the upper atmosphere in the Northern Hemisphere. When planes fly through this higher atmosphere, the radioactive fallout cloud is sucked into the cabin of the aircraft, together with radioactive hot particles. This article by By Michael Collins, EnviroReporter.com documents a flight across America on December 23rd 2011. The big differences between him and his new wife, and the normal passengers, was that they took a Geiger counter and also wore respirators. Hot particles where detected on their respirators at the end of the flight. Also they had readings as high as 1,238 CPM in flight, or over 36 times higher than the background radiation in the jet, at the terminal. This article clearly shows the dangers in travelling by air in the Northern Hemisphere at present. Pregnant women or small children are much more sensitive to the effects of radiation. So it is important that your family becomes fully aware of the risks of travelling overseas at present. If they are not aware of the risk, they can't take action to protect themselves. These articles suggest that travel hubs are becoming concentrators of radioactive fallout carried around by people travelling through them. Again it is the ingested radiation that is the most dangerous, because you can't get away from it. Try as best you can to educate your families to the present risks, as there is no main stream media reporting of this issue. I would like to point out again that the people in these reports are using radioactive testing equipment that clearly shows what they are reporting is true. So there is strong physical evidence to back up what they are saying! UPDATE: 22 Febuary 2012 another report of high radiation levels when flying across America. It is normal to have raised radiation levels of 4x to 5x ground background levels when flying at high altitudes. This is way above that! Measured radiation on a flight from Flint Michigan to San Diego, CA and @ 32.000 feet, "Radiation reached approx. 2.85 mcSv/h Microsiverts per hour"
Nuclear Power Technology, an extinction level event. The steady-ish readings of 0.81 (photo) were taken when I came in off the street. It was briefly reading 1.89 on the street in the wind. I decided to come inside asap to the back yard, and then left the GS sitting outside for a while (0.25 photo) - checking on it. I'm in a relatively sheltered section. There was no way I was going to stand in ~2 microSieverts per hour in the wind!! No detectable radiation on me as such, it appears to be in the air. I can only speculate as to what it is. To be honest, it scared the cap out of me! I remember waste drums putting out 1.2 micros per hour ... but almost 2 in the wind - well?! You don't stand in that and wait around. So far, I've kept it relatively quiet from the press, and shall continue to monitor - as we have a rain front system approaching from the South. I'm not sure how to handle this, as I wish to maintain a very very low profile. It is clear, that both ARPANSA and NRL are intentionally playing dumb. That said, it is probably best that I feed information to you, and it can be used at your end effectively. I'm now set up with camera and logging everything on 1 minute sampling (in case the data fouls on transfer and also that a photographed reading says more than a data point)"
The Gammascout was reset to collect data (as its memory was full), and the sampling window set to 1 minute. Several excursions were made outside to investigate the conditions, and the results can be seen in photographs and in the logs supplied. These were recorded in a sheltered 'back yard'. These logs did not record the peak events see earlier, unfortunately. Further monitoring will take place in conditions when the wind direction is from the Tasman Sea. Further photographs await processing on 35 mm film." 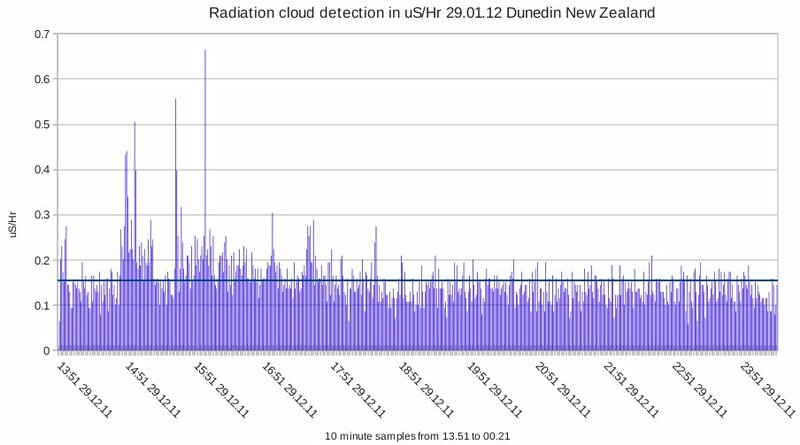 Another radiation cloud, this time a massive 4.5 uS/Hr passing over Dunedin New Zealand 1st February 2012, around 1 to 2am in the morning, during a rain event!
" The GS unit wasn't set properly after the first recorded spike. Hence, the uncorrected date data was published. The time is correct, for the date specified ... it was never envisioned that fallout would be here, and the date was never correctly set after its last service. The missing patch between the logs is the down time for the GS uni switching from 1 minute to 7 day logging as the memory fills. Average 24 hours is 0.14 ... climbing to 0.23/0.24 and higher for these events ... and lasting for a while post ... dropping to 0.14 from 0.23 ... inside. The dip after the heavy counts is really curious, and has been seen with several GS units. There is not explanation ... none. But it is real ... the ocean/beach rate here is 0.03 to 0.05 micro/hr ... land is a bit warmer. The evening that it occurred coincided with a heavy brief downpour .... when the rain stopped, so did the radiation. The drops were really large, and weird ... also, there had been fallout previous to the unit being reset - you can see the earlier blips. Some of the earlier zeros are from guests playing with the unit resetting it. These were recorded inside - outside would have been hotter. You can see the different spikes as the gs unit was moved to the window ... the window was slammed shut ... and there is 2 feet of brink and mortar in this place! Solid as!! We have had a smaller event her recently also with the rain ... as the ground dries up, it does as well. Background stays elevated for a bit ... then it disperses. Short half life and mobile. Either or, in the rain, or free in the wind ... with small amounts of residue ... "
How governments can arbitrarily raise so called radiation safety levels. No increase is safe! Brief large spike in local background radiation. What caused it? This spike in radiation was detected on the 8th January 2012, on the Sunshine Coast, Australia. The wind direction was NNE at 22degrees. Geiger Counter Alarm starting going off at around 6.30 pm. Raised radiation levels lasted until around 9.45 pm. 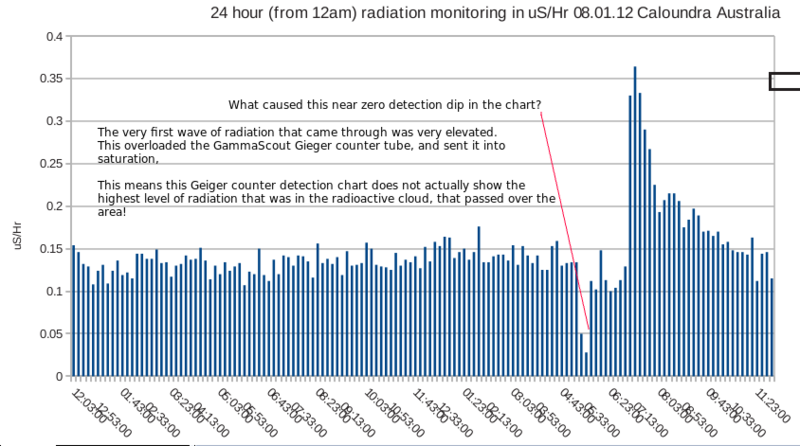 The Gammascout Geiger Counter alert alarm was set to go off at 0.50 uSv/Hr, and to record data every 10 minutes. I was shocked to hear the Geiger alarm going off. Visual observations showed actual peaks reaching 0.80 uSv/Hr. Even though this chart of the downloaded 10 minute interval recorded data is not showing the true peaks that occurred, it is still dramatic. If the maximum visual observed peak had been recorded, the peak on this chart would be over twice as high! The beginning of the chart would be considered average background for our area. Background radiation levels here, with 4 years of recorded data to refer to, has averaged around 0.10 uSv/Hr. The background radiation level was peaking 8 times above average during this event! Either some of the radioactive fall out from Fukushima has briefly reached us, or there is some seismic activity N/NE of our location in the Pacific Ocean which has released a spike in radon gas. Just a theory. The dramatic drop in background reading just before the spike is also interesting. Anyone have any ideas? I promised members that I would post any unusual radiation data, I just didn't expect to be doing this so soon. Here is an article at The Sunshine Coast Daily, the local paper on this event, plus an interview on New Zealand radio station GreenplanetFM. Click the play button next to the speaker icon, to listen to the radio interview, that starts after a bit of an introduction on synchronicity. I have since had a report from someone in New Zealand. 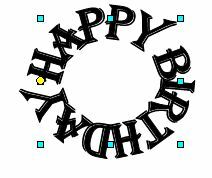 He detected 0.33 uS/Hr. He had wiped down a small area of a wet car, and then tested the cloth. He indicated that this was above their normal background level. This was 2 days after my report. What ever you were detecting blew this way, and precipitated in the rain. Here are four theories on what caused the spike in radiation. My theory is that there was an event at Fukushima around late December 2011 - new years 2012 that released a large amount of radiation. The weather conditions where similar to those of March / April 2011. The (NILU), Norwegian Institute for Air Research had run simulations which predicted the creation of world wide radiation fallout clouds from the Fukushima nuclear disaster for March / April 2011. 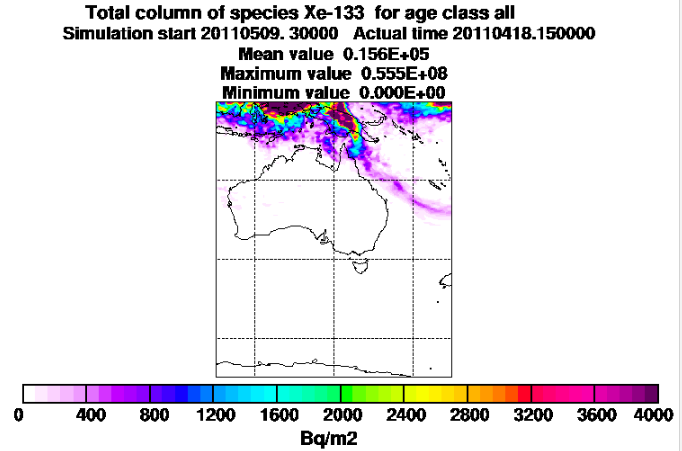 One of these simulations for March / April 2011 indicated that a radiation cloud would form off the east coast of Australia. This year the cloud formed again but blew inland, and didn't stay off the coast. 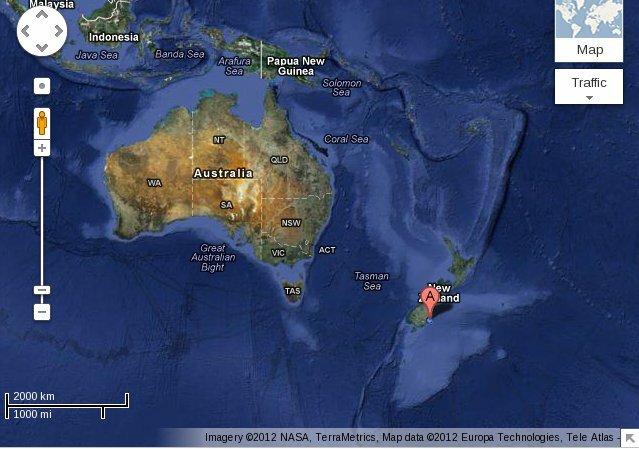 Here is the NILU map of the March /April 2011 radiation cloud off Australia's east coast. See all the Fukushima radiation cloud simulation maps for 2011 by NILU here. Potrblog have gone to a lot of trouble, and put a detailed youtube video analysis of the Caloundra radiation spike event on the Internet. These people have done similar analyses of American radiation fallout events. This is their theory. Here are new background radiation level charts that show raised radiation levels for January 25th, 27th and February 25th 2012. This week starting January 23/01/2012, we have had over 300 mm of rain. Rain troughs have been coming from the Australian northern tropics constantly for days now. It would appear that our average daily background radiation is increasing since the spike event on the 8 January 2012, (see chart above). I am now recording local background radiation every minute, so I am more likely to record those spikes. You will notice that the dark blue radiation average for 24 hours line in the new charts has crept up above 0.15 uSv/Hr to 0.18 uSv/Hr over the two days. Radiation spikes are now going above 0.3 uSv/Hr, plus background readings are much more volatile. Up until the 8th January 2012, I have not seen spikes go above 0.2 uSv/Hr at my location. These charts represents the highest average so far for the 4 years of data I have collected on local background radiation levels. Our average local background over four years has been around 0.10 uSv/Hr! Another radioactive cloud passes over on the 25 February 2012, 24 hour chart - one minute sampling. The highest recorded peak was 0.34 uSv/Hr at 7.33 am. More spikes of 0.30 uSv/Hr between 7am to 8am in the morning. Dark blue line in the 24 hour chart is the daily average, 0.146 uSv/Hr. This all happened at the end of a significant local rain event. Some local areas received 340 mm of rain in 24 hours. 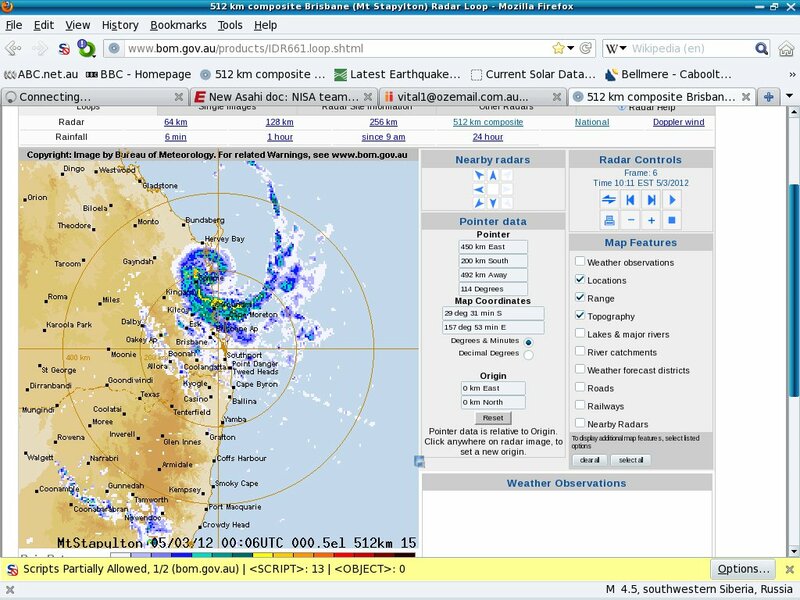 I looked at the local weather radar at the time and the rain event came in off the ocean from the north north east. 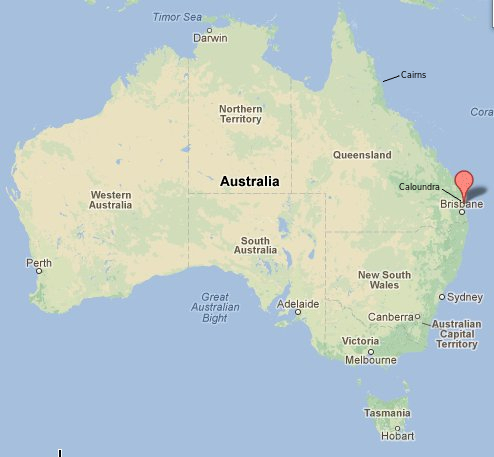 The same direction as the radiation cloud that I detected passing over the east coast of Australia on January 8th 2012. Another radioactive cloud passes over on the 5th March 2012, 24 hour chart - one minute sampling. The highest peak was a visual observation of 0.63 uSv/Hr after the Geiger alarm went of, lots more spikes of 0.30 uSv/Hr and above falling off in the late afternoon . Dark blue line in the 24 hour chart is the daily average, 0.185 uSv/Hr. This all happened during a significant local rain event. I looked at the local weather radar at the time and the rain event came in off the Pacific Ocean in a strange spiral pattern from the north. So far. all our radioactive cloud detections have occurred when the wind has come from the northern tropics. From my observations of the weather radar at the time, on the 20th and 21st, two air masses, a northerly and southerly, meet just north of Caloundra. 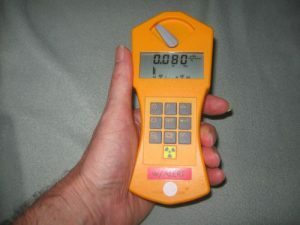 The Geiger Counter alarm sounded on numerous occasions, indicating radiation levels went above 0.50 uSv/hr multiple times. These above 0.50 uSv/hr events where brief and were not recorded by the Geiger Counter data logger. My theory is that when the northerly pressure system pushed a little bit south, we got the radiation detections. When the northerly air mass was pushed north background went back to normal. The radioactive cloud detections are a result of the huge amounts of radiation released by the still active Fukushima Nuclear disaster, breaching the Northern and Southern hemisphere air circulation barrier. Here is the chart for the 23rd, peaks not as high as the 20th and 21st April, but the days overall average radiation level was higher. Disclaimer: This is a amateur volunteer run service. Human error can provide incorrect information, and equipment malfunction can produce false readings. Do not rely on, or take action upon information presented on this web site, without further research. Views expressed in the pages or images on the SCCC Inc., site maybe the personal opinions of the relevant writers, and are not necessarily representative of those of SCCC Inc. Previous generations had the view that it was a scientific fact it was impossible to fly, or to have large metal ships that float, or travel under water. New, previously impossible technologies and possibilities are created, as new information and discoveries are added to the human collective intellectual database. We are constantly told about new scientific discoveries. But what are scientific discoveries? Nothing more than what was already possible in the world, but humans where not aware of it. So if that is the case, doesn't this show that what we consider as fact can be changed in an instant with new information? It is always important to keep an open mind, and a view that anything may be possible. You have all been taught that the Earth and the planets revolve around the Sun in elliptical orbits. That is true if you think of the Sun as stationary. The Sun is actually moving around the centre of our Milky Way Galaxy at 220km/sec, a phenomenal speed. That the means that the planets are actually traveling in a spiral through space, if you take into account the 220KM/sec motion of the Sun. You can look up this information about our Sun here, http://en.wikipedia.org/wiki/Sun Just taking into consideration an object as huge as the Sun's size and mass, traveling at 220Km/sec, plus our tiny planet is following it while spinning around, it's just incredible! This means that our set perspective of what we considered factual and possible, about the motion of the planets and the Sun, has just changed in an instant with new information. Is it possible that someone now has the technology to artificially create earthquakes? There seems to be evidence that this is the case. I keep an eye on earthquake activity throughout the world on a daily bases. 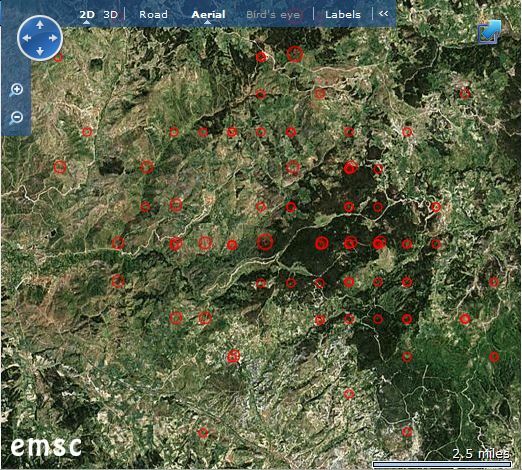 Looking at the grid pattern of small earthquakes in the screen shot below. This is definitely unnatural. Each dot represents the epicentre of an earthquake over a week or less, showing up in Turkey, on the European Earthquake monitoring system in May 2011. The first thing you find out when you use these facilities, is that they don't show you all the worldwide earthquake activity on any of these sites. You need to be looking at both sites to get a better world view of earthquake activity. To get to the main point, look at this youtube video below. This was put up on youtube on May 22, 2011. I don't necessarily agree with all the views in this video. I am mainly interested in the earthquake grid pattern they discovered. Then read this article at the Colin Andrew's site. The images at the Colin Andrew's frame grabs, are of the Canary Island swarm of earthquakes just before the Volcano El Hierro submarine volcano erupted recently. 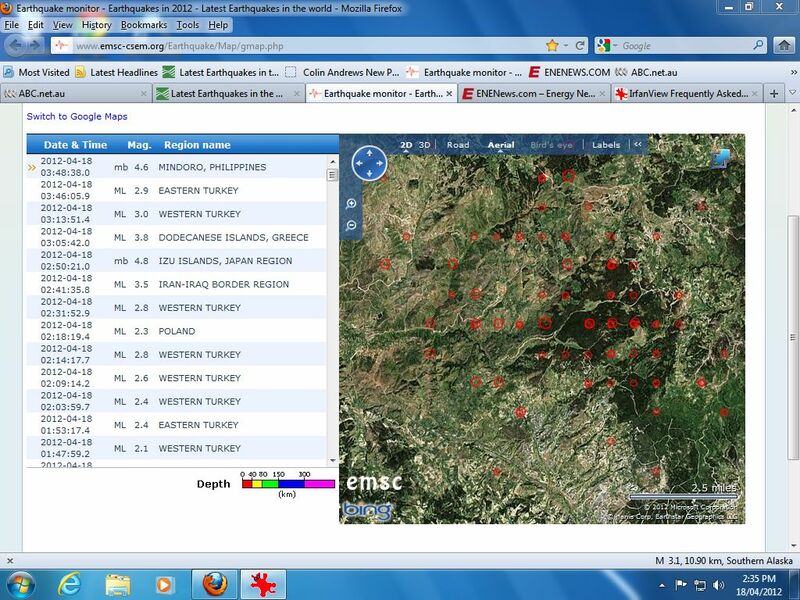 The screen shot was taken from the official European-Mediterranean Seismological Centre website on October 8, 2011. I was at the European-Mediterranean Seismological Centre website and viewed the Canary Island earthquake activity myself in real time, and found a similar, but smaller active grid pattern of earthquake activity on the northern ocean side of the island, on the 21th and 22th of November, around the El Hierro Volcano vent that is erupting below the sea. Here is information about the Canary Island El Hierro Volcano eruption that started recently. This evidence would suggest that there are artificial earthquake experiments taking place for the creation, or control of earthquakes, or volcanoes in this case. You just do not get epicentres of earthquakes happening on perfect grid patterns, they are random. I have been looking at earthquakes for years and have never seen patterns of this type ever, until now. So far, different observers have seen these earthquake grid patterns at different times. They have been small earthquakes in magnitude at present. They have also shown up in real time on the earthquake monitoring systems in different locations. The El Hierro grid pattern earthquakes I observed, all had the same depth of around 20Km and were approximately around the same magnitude of between 2.7 to 3. This is also very unnatural. The earthquake activity at the Canary islands is a big deal because of the potential disaster it could create! If you look up HAARP or scalar technologies on the Internet, you will find lots of information and patents that have been granted for these types of technologies. A very quick summary on the theory of how these HAARP technologies work. They use powerful giga watt directed energy beams, generated from ground stations or satellites, and reflect this energy beam off plasma mirrors they have strategically created in the Earth's Ionosphere. This allows them to accurately focus that beam to different locations around the world to affect the weather, or create earthquakes. Lots of countries, including the major powers, have facilities to experiment with these technologies. These recent earthquake grid observations suggest that someone is refining their technology to be more focused, accurate, and effective. Are these earthquake grid patterns proof someone is experimenting and refining this type of technology? 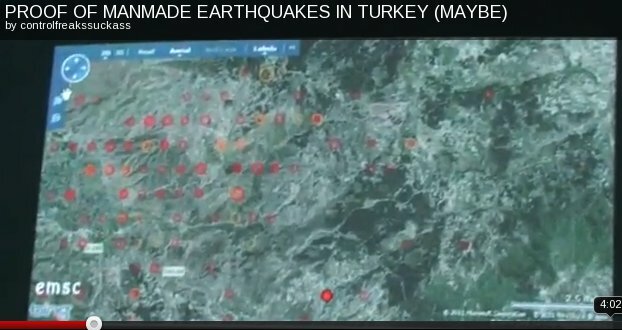 I took these screen shots below of seismic activity in Turkey 18.04.2012. No way this is natural, earthquake activity is random. These earthquake grids when they appear consist of lots of small earthquakes around 2 to 3 on the Richter scale all around the same depth. These small grid earthquake patterns can last for days. They tend to try and hide this activity by clustering a lot of small earthquakes in a relativity small area. Unless you focus in on this cluster activity and magnify it, you would not notice it. This activity has been quite for some time but I detected this yesterday on the European Mediterranean Seismological Centre ( http://www.emsc-csem.org/Earthquake/Map/gmap.php ) web site and took these screen shots. These earthquake patterns can last for days in one place. Is it like pushing softly on the plate to see what will happen, or is it to try and relieve plate pressure? Or is it "Look what we can do," cooperate or else? The other question is who is doing it? Feel free to distribute this article. Masses of Subliminal Deception Everywhere! I think you will all be shocked at all the subliminal messages in modern media, even in what you consider to be safe children's media! Thought it was illegal? Think again! 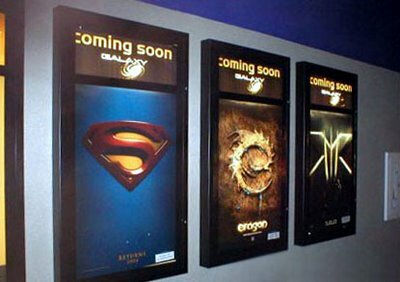 Modern technology allows modern advertising agencies to created multi layered images in media that is very sophisticated. These layered images contain subliminal messages to sway your opinions, or to just get you to purchase something. Unless you are looking carefully for this content , you won't even notice it! If you go to youtube and type in “subliminal messages” in the search facility, you will find lots of other information on the subject. You will also be shocked to find lots of subliminal adverting hidden children's movies, games, and products of well known family oriented brands, which you considered safe for your children, and grand children. Understand clearly that everyone in modern society is being subject to this constant subliminal imagery from a very early age, so that their opinions and desires can be constantly influenced to create the outcomes desired by those using these technologies! Subliminal message techniques are employed to influence and entice you to make decisions about what product to purchase, what candidate or political party to vote or not vote for , or even change your opinion on an important subject. 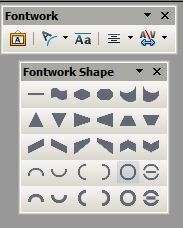 This technology uses a very sophisticated knowledge on how the human mind works, plus the power of modern computer graphics techniques to embed lots of subconscious messages into imagery. The video above was very quick introduction to the subject of subliminal advertising. Below is a link to a video which has leaked pages from a advertising training manual on subliminal advertising techniques. In the intro to the course the manual states that there is no refund for the course, as one third of those doing the course drop out because they become so discussed with the courses content. The ad manual explains the much more sophisticated multi layered image symbolism techniques used by advertisers, and why they are used. I think you will be shocked by its content! This particular Sharpie Self Expression Commercial 2011 has recently created a lot of controversy in America. Whether you believe in the ideas behind the "Occupy Wall Street " protest in America or not, this commercial appears to have a completely different agenda to that of selling Sharpie, and a direct attempt to pacify the American populace. Look for the "Stop Protesting Now", banner about 11 and 12 seconds into the ad. You can pause it there. The average person in society is easy to influence. They are being constantly bombarded with large numbers of these loaded messages from birth to death, by digital and the print media. For more subliminal information across a broad range of subjects Subliminal Manipulation is a great site. (Link below) This site has been taken down a couple times, and the accounts closed , because they want to keep this information secret, and the site creator has had to create new sites. Back up the site on your computer if you want the information for future reference, or just to show the family how insidious this all is, if it goes down. They think you're dumb and need to be lead by the nose! 1984 happened, you just didn't know it!